Expedia UK needed a listicle writer for travel industry blog posts to help boost their growing vacation rentals market. 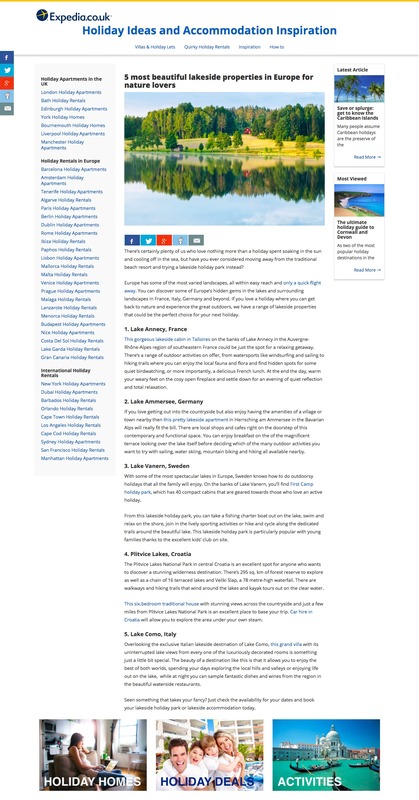 Writing listicles for the travel industry is a really great way for travel companies to showcase some of their best products as well as hitting those all-important SEO keywords. These types of posts are easy to read for the information-hungry B2C audience. They’re also super-shareable, as well as being easy to repurpose into more tasty social media posts for a travel company’s own content. I took some time to research just the right places to include in this blog post from Expedia’s selection of gorgeous vacation rental properties, to make sure that the post was engaging and balanced for readers, as well as ticking all the right boxes for driving them to make a booking on the site. I’d love to hear your ideas for new posts for your website’s blog that I can turn into sparkling content that will really click with your target audience. Why not get in touch through my contact form.